The earlier Civil Rights Act of 1957, was the first law addressing the legal rights of African Americans passed by Congress since Reconstruction, had established the Civil Rights division of the Justice Department and the U.S. Civil Rights Commission to investigate claims of racial discrimination. . The new law was badly watered down, however, to meet the criticisms of southern Democrats in the Senate. Before the 1957 bill was passed Congress had, however, removed a provision that would have empowered the Justice Department to enforce the Brown v. Board of Education decision. 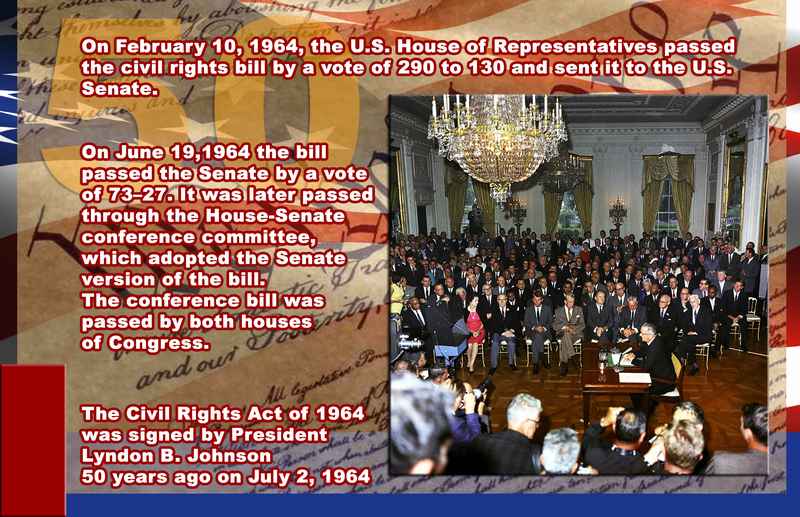 On a Monday night, February 10, 1964, the House passed the civil rights bill by a vote of 290 to 130 and sent it to the Senate. At 9:51 on the morning of June 10, 1964, Senator Robert C. Byrd (Democrat-West Virginia)completed an address that he had begun 14 hours and 13 minutes earlier. The subject was the pending Civil Rights Act of 1964, a measure that occupied the Senate for 60 working days, including seven Saturdays. A day earlier, Democratic Whip Hubert Humphrey, the bill’s manager, concluded he had the 67 votes required at that time to end the debate. On June 19,1964 the bill passed the Senate by a vote of 73–27, and quickly passed through the House-Senate conference committee, which adopted the Senate version of the bill. The conference bill was passed by both houses of Congress. The Act was signed into law by President Lyndon B. Johnson on July 2, 1964 at the White House. Just five days after President John F. Kennedy was assassinated in November 1963, Lyndon B. Johnson went before Congress and spoke to a nation still stunned from the events in Dallas that had shocked the world. That chapter became the Civil Rights Act of 1964. Assistant Attorney General Nicholas Katzenbach was the administration’s point man in the coming struggle, and he advised beating the southerners at their own game. The pro–civil rights senators should simply out-organize and outlast the southerners until the necessary votes for cloture had been gathered. Humphrey agreed. Johnson was skeptical at first but allowed himself to be convinced. Humphrey’s Democratic forces prevented the filibustering southerners from using the parliamentary device of a quorum call, then resting their voices and their feet, while keeping the floor. To get enough votes to impose cloture, Humphrey needed Dirksen’s support, and some compromises were required. On May 13, Humphrey and Dirksen agreed on a key issue—the government would sue only in cases involving a “pattern or practice” of discrimination in public accommodations or fair employment. Not until June 10, however, was Mansfield able to call for a vote on cloture. The Senate then voted 71-29 to shut off further debate. On June 19 the Senate passed the civil rights bill, 73-27. On July 2, the House voted 289-126 to accept the Senate version of the bill. 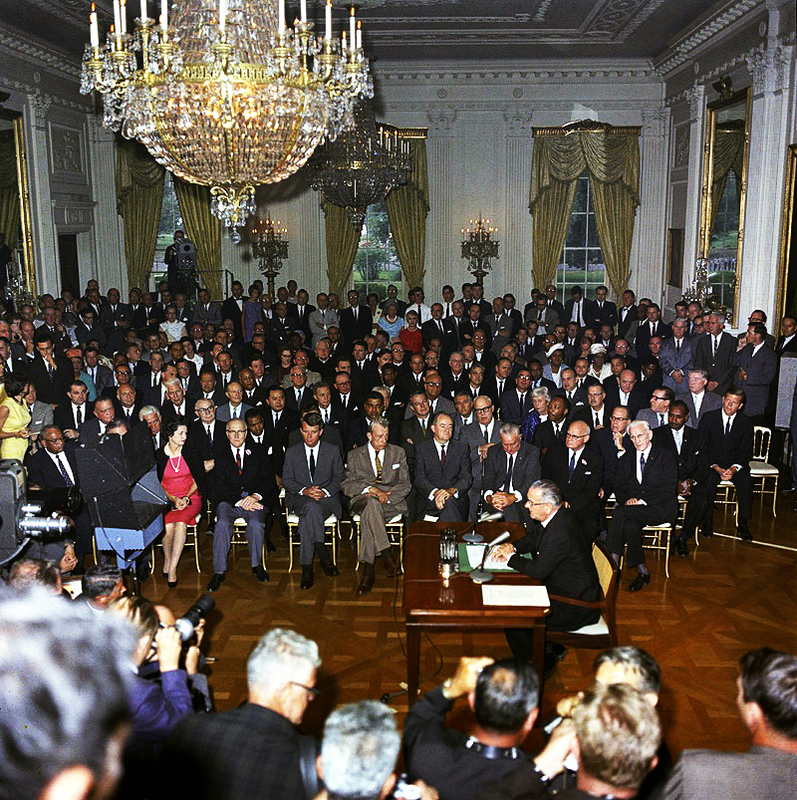 On the same day President Johnson signed the Civil Rights Act of 1964 in the East Room of the White House. The act elaborated on some voting rights issues in Titles I, VIII and XI, but the true successor to the civil rights measures of 1957 and 1960 was the Voting Rights Act of 1965. In the 1964 legislation, employment discrimination was addressed in Title VII, the only one in the 1964 act to include gender as a protected category, owing to Judge Smith’s miscalculation. The principal objects of attention and controversy in 1964 were the provisions mandating desegregation of public accommodations and facilities. Title II contained the prohibition against discrimination on the basis of race, color, religion or national origin in public accommodations such as restaurants, lodgings, and entertainment venues if their operation “affect[ed] commerce” or if such discrimination was “supported by State action” such as Jim Crow laws. Title III permitted the Justice Department, upon receipt of a “meritorious” complaint, to sue to desegregate public facilities, other than schools, owned or operated by state or local governments. Title IV permitted the attorney general to file suit to desegregate public schools or colleges under certain conditions, but it explicitly did not empower any federal official or court to require transportation of students to achieve racial balance. Beyond its effect against racial discrimination, the language in this title was the model for subsequent anti-discrimination legislation affecting gender, disabilities, and age. And Hugh Davis Graham has argued that Title VI, not Titles II or VII, which appeared to be the most important at the time, was actually the most significant because of its application in succeeding years to other institutions that had come to rely on federal money. The night that the Civil Rights Act of 1964 was passed, I found him in the bedroom, exceedingly depressed. The headline of the bulldog edition of the Washington Post said, “Johnson Signs Civil Rights Act.” The airwaves were full of discussions about how unprecedented this was and historic, and yet he was depressed. I asked him why. In the 1964 Democratic Convention, the major debate was whether to seat the the regular white supremacist Mississippi Democrats or the Mississipi Freedom Democratic Party organized by civil rights activists. In this phone conversation President Johnson and Mayor Wagner discuss how to prevent the seating of the MFDP to prevent a walkout of other southern delegations. This is the last speech given by the Former President before his death on January 22, 1973. The Voting Rights Act of 1965 is federal legislation in the United States that prohibits discrimination in voting. On August 6, 1965 President Johnson signed the Act into law. AUSTIN, TEXAS – The LBJ Presidential Library will host a Civil Rights Summit April 8-10, 2014, to mark the 50th anniversary of the Civil Rights Act of 1964.